See more objects with the color tan peru teal sienna lightseagreen or see all the colors for this object. This is a scissors. It was invented by Jake Zien, Charlie Dougiello, Jacob Bonaire, Richard Moreen, Sonia California and Spike Mendelsohn and designed by Quirky and manufactured by Quirky. It is dated 2013. Its medium is plastic, non-slip rubber, stainless steel. 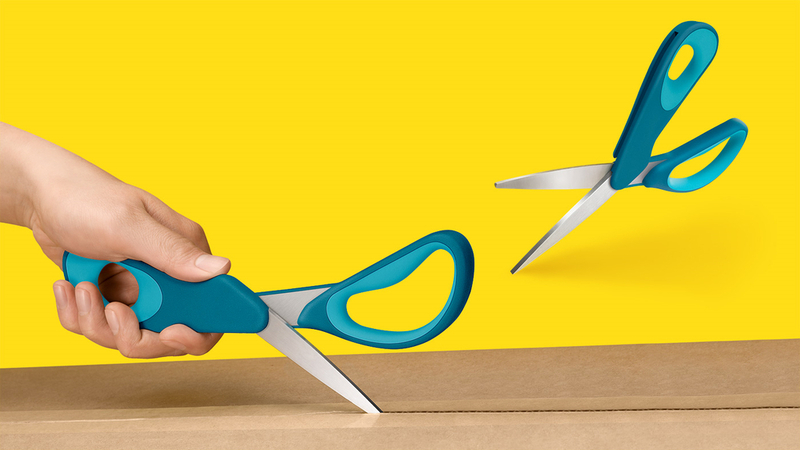 Resembling a pair of standard scissors, Sheath transforms into a single blade that can be used for scoring paper, opening boxes, and curling ribbon. To use the scissors in single-blade mode, the user tucks the unwanted blade inside the grooved handle. Quirky designs and manufactures real people’s inventions by inviting the public to submit and participate in the development process. At meetings held online and in person at Quirky’s headquarters in New York City, members gather to evaluate ideas. Quirky’s designers, engineers, and marketing experts work closely with the community on nearly all aspects of development to bring approved ideas to life. Each Quirky product is a direct response to an everyday problem. This object was donated by Quirky. It is credited Courtesy of Quirky.